Scientists under the direction of ETH Zurich have created a minor sensation in synthetic chemistry. They succeeded for the first time in producing regularly ordered planar polymers that form a kind of “molecular carpet” on a nanometre scale. Today, more than ninety years after Staudinger’s discovery—for which the chemist was honoured with the Nobel Prize in 1953—about 150 million tons of plastics are manufactured every year. A gigantic industry developed, without whose products our daily life is no longer imaginable. Polymers are formed when small single molecules known as monomers join together by chemical reactions like the links of a chain to form high molecular weight substances. Since qualifying as a lecturer, Schlüter was already occupied by the question of whether polymers can only polymerise linearly. 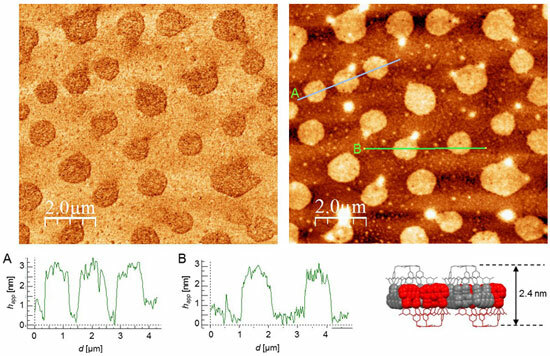 Although graphene counts as a natural representative of a two-dimensional polymer—the carbon atoms in graphene form a honeycomb-like pattern through triple bonds—it cannot be synthesised in a controlled way. The researchers decided in favour of the second alternative: the doctoral student Patrick Kissel successfully used this to crystallise special monomers which he had prepared into layered hexagonal single crystals. For this he generated photochemically sensitive molecules for which such an arrangement is energetically optimum. When irradiated with light with a wavelength of 470 nanometres, the monomers polymerised in all the layers. 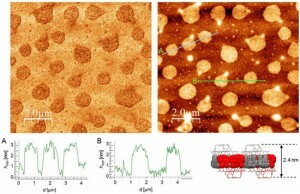 In fact there are small defined holes with a diameter in the sub-nanometre range in the regularly arranged polymers. Moreover, tiny hexagons in the polymers, formed by benzene rings with three ester groups, can be removed by a simple hydrolytic process. This would form a “sieve” with an ordered structure suitable for the selective filtration of molecules. However, before the researchers can think about practical applications, the task now is to characterise the material’s properties. According to Schlüter, this is mainly a job for the physicists. One of the exciting questions in this respect will be how a two-dimensional polymer behaves compared to a linear polymer, for which a good physical and technological understanding is available. Schlüter assumes that two-dimensional polymers could have a different physics and will therefore also find different applications.